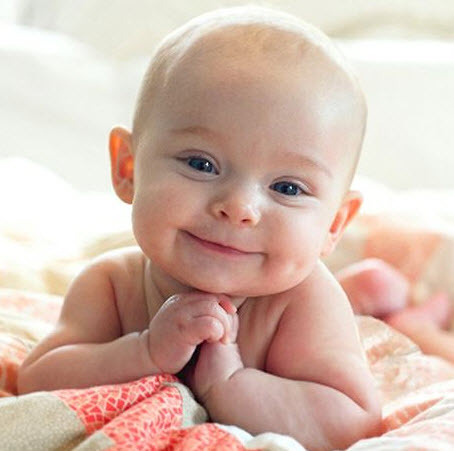 There's a new Gerber baby and she is absolutely adorable. She looks like a little Renaissance Italian baby -- literally. She even has the pose down pat. Each year Gerber holds a Be Our Baby Photo Search contest to find a potential face for the baby food brand. Well, they sure found a winner this year. Grace is a 7 month old baby from Lancaster, Pennsylvania. She beat out 180,000 other babies to win a prize of $50,000. Every parent thinks his or her baby is the cutest baby, but in this case the parents are absolutely correct. Grace also gets a year of baby food, and the opportunity to appear in ads for the baby food company. Surprisingly, this amazing photo was not taken by the professional photographer at Gerber. It was taken by Grace's mother Gabrielle, who said this was only the fifth shot she took. Gabrielle said, "She [Grace] must have taken her hands out of her mouth and posed them like that for a split second because I didn't even realize how cute she was posing until after I was completely done taking pictures and looking back at what I had just taken!" Grace was introduced to the world on The Today Show. Billy Bush was sitting in for Kathy Lee Gifford with co-host Hoda Kotb. Grace looked so precious in her purple outfit and violet headband. She seems really chatty and happy, and even allowed dad of three girls Billy to pick her up without complaint.